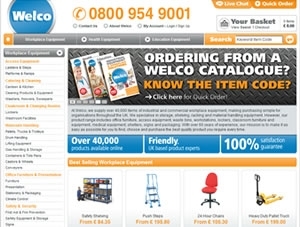 Welco (part of the Brady group) sells industrial and commercial workplace equipment.The company had already been running a Google Adwords campaign. they had just upgraded their website to the latest Enterprise Magento platform and were looking for an experienced PPC agency to further improve the account’s performance. Following tha launch of new eCommerce store using the open source Magento platform, the PPC objective was to significantly improve conversion figures by increasing conversion rate, reducing the cost per conversion and increasing the number of transactions. ExtraDigital took the following approach, combing both strategic planing and operational management of the account. Enabling conversion tracking for three types of conversions: sales, catalogue requests and contact forms. Within the first month the results exceeded the initial targets set. Effective PPC management will give significant increases to existing campaign performance and the increased revenue from PPC campaigns will be significantly more than the PPC management fee. ExtraDigital have expertise in managing PPC campaigns for many Magento eCommerce stores and we understand the opportunities available to produce feeds from the Magento platform and how to create optimised landing pages and AB testing.